The monster volcano Barbarbunga, one of the most active and powerful volcanoes in Iceland and Europe, trembled yesterday afternoon. A sharp 3.9 magnitude earthquake was detected at 16:13 on Sunday afternoon, followed by a handful of smaller quakes. The volcano has been relatively calm in 2018, with only a handful of 3+ magnitude quakes. The relative calm comes at the heels of relatively high levels of activity in 2016 and 2017. Since the largest earthquake to hit Barbarbunga at the end of January, a 4.9 magnitude quake. A 3.9 magnitude quake is considered a significant seismic event, as any quake in an active volcano which is larger than 3 on the Richter scale is considered a powerful quake. Quakes larger than 4 in volcanoes are relatively rare. 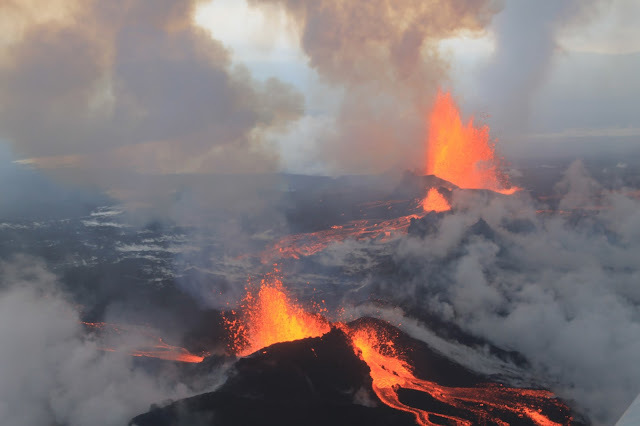 According to the Seismic Monitoring System of the Icelandic Meteorological Office, the epicentre of the 3.9 magnitude quake was 5.9 km (3.7 mi) Northeast of the centre of the volcano's caldera at a significant depth of 3.3 km (2 mi). Barbarbunga has been showing a significant level of activity in recent months. The quakes are connected caused by magma being thrust from the earth's mantle up into the lava chambers of the volcano. The volcano has been re-filling it's lava chambers since the end of the 2014-15 Holuhraun eruption. Barbarbunga, which is one of the most powerful volcanic systems in Iceland, is hidden beneath the north-western part of the ice cap of Vatnajokull glacier.